Approved and recommended by Quick Find Directories, Prestantia Property Services aspire for complete customer satisfaction with quality workmanship and prompt attention, whilst providing an excellent level of expertise, experience and commitment to quality and reliability. A local trusted trader in Redditch, Bromsgrove, Rubery and surrounding areas. "We called out Prestantia after trying to unsuccessfully disconnect a washing machine. We had water gushing everywhere, and the kitchen and hallway were flooded. The engineer arrived about 15mins later and couldn't believe the state we were in. He was absolutely fantastic and sorted the problem quickly, and plumbed in the new washing machine. Extremely impressed with the response time, and the engineer was very helpful. Highly recommended." "We searched the net for work men who were reliable and honest and we found Richard. He came out to give me a quote and he was prompt, on time, very polite and helpful. I decided to have Richard complete more work based on my gut feeling and he completed a fantastic job. He fully intstalled a brand new central heating system in an very old house. He came on Tues and it was all done by Thurs. I would def recommend Richard again. Richard has also been able to advise me of details of a very good electrican and carpenter. I would definatley use Prestantia again. Thanks Ricahrd"
"Im am a landlord and have recently been using Prestantia to carry out any maintenance and repair work on a few of my properties. I am finding Prestantia to be very reliable and professional whether it be for boiler services and repairs, plumbing, carpentry or any other aspect of property maintenance work. 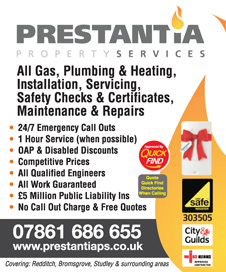 I am extremely happy with the quality of workmanship from Prestantia Property Services and am to use them from now on. Recommended to anyone !" "Prestantia have just finished fitting Our new bathroom. Richard went through our options with us from the very start in designing & fitting exactly what we wanted. They knocked the toilet and bathroom into one and completely redesigned the layout. From fitting spot lights to tiling the floor, we are very happy with the quality of work, professionalism & attention to detail from all the work men from Prestantia Property Services. I have already recommended them and my wife loves her new bathroom. Thank you !" "Highly Recommended. Our old central heating system would have cost a lot to repair so Richard from Prestantia took us through a few options and we decided to have a new more efficient Worcester Bosch. This will save us money on our gas bills and will cost a lot less to service every 12 month. We found Prestantia Property Services to be a very reliable and professional company providing a great service and great value for money." "Were honest genuine & reliable. Turned up when they said they would."